Barbell squats, machine leg presses, dumbbell lunges and their dozens of variations make up the crux of most effective quadriceps fitness routines. But what if you don't have access to free weights or machines? 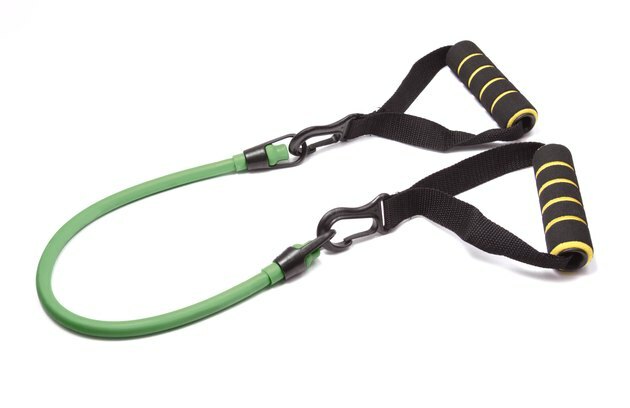 Resistance bands, flat lengths of rubber elastic material, offer an affordable, convenient alternative. Resistance bands won't provide you with as much resistance as free weights and machines, but they do provide some resistance and you can perform all the same exercises. Bands are long, flat lengths of rubber elastic material. They are typically 2 to 6 inches wide and 3 to 6 feet long. When performing quadriceps exercises with resistance bands, wrap the ends of the band securely around your hand. Bands are available in a variety of tensions, from extra-light to extra-heavy. Double up on bands or shorten a band by wrapping it more times to increase the resistance level. For the squat exercise, hold the band one of two ways depending on its length and tension. If the band is relatively short and has medium to heavy tension, you can relax your arms by your sides. But if the band is long and has light tension, you may need to hold your hands in front of your shoulders to stretch the band and create enough resistance to challenge your quadriceps. Step on the middle of the band with your feet about hip-width apart and your toes pointing forward. Descend into the squat by pressing your hips back as if you are going to sit down in a chair. When your knees reach a 90-degree angle, pause and then press through your heels to return to the starting position. Take a split stance with your right foot in front of your left. Step on the middle of the band with your right foot and hold the ends in front of your shoulders. Keep most of your weight on your right leg; this is the working leg. Bend both knees and drop into a lunge, lowering your left knee toward the floor. Do not press forward; focus on descending straight down. When your right thigh is parallel to the floor and your left knee is a few inches above the floor, pause for a count, push through your right heel and then straighten both legs. Complete all repetitions on one leg and then switch legs. Stand in front of a chair and hold the middle of the band against the back of your right ankle. Cross the ends of the band around the front of your ankle and then run them to one of the rear legs of the chair. Tie the ends of the band to secure it around the chair leg. Sit on the edge of the chair with both feet flat on the floor. To start the exercise, lift your right foot slightly off the floor. Do not put it back down until the end of the set. Extend your right knee until your leg is parallel to the floor. Do not lock out your knee. Pause before returning to the starting position. Complete all the repetitions on your right leg and then switch legs. You can perform band leg presses either lying flat on your back or sitting in a chair. The movement is the same. For the lying version, lie on the floor with your left knee bent and your foot flat on the floor. Wrap the middle of the band around the arch of your right foot and hold an end in each hand. Place your upper arms flat on the floor with your hands in front of your shoulders. Start with your right knee bent near your chest. Press through your right heel and extend your right leg against the resistance of the band. For the seated version, sit on the edge of a chair and perform the exercise in the same manner as the lying version. Repeat with your left leg.